Back in June, for my Mom’s birthday, I posted a bunch of reasons I love her. Today is my dad’s birthday (Happy Birthday Dad!) and I figured it was only fair to write a post to him as well. 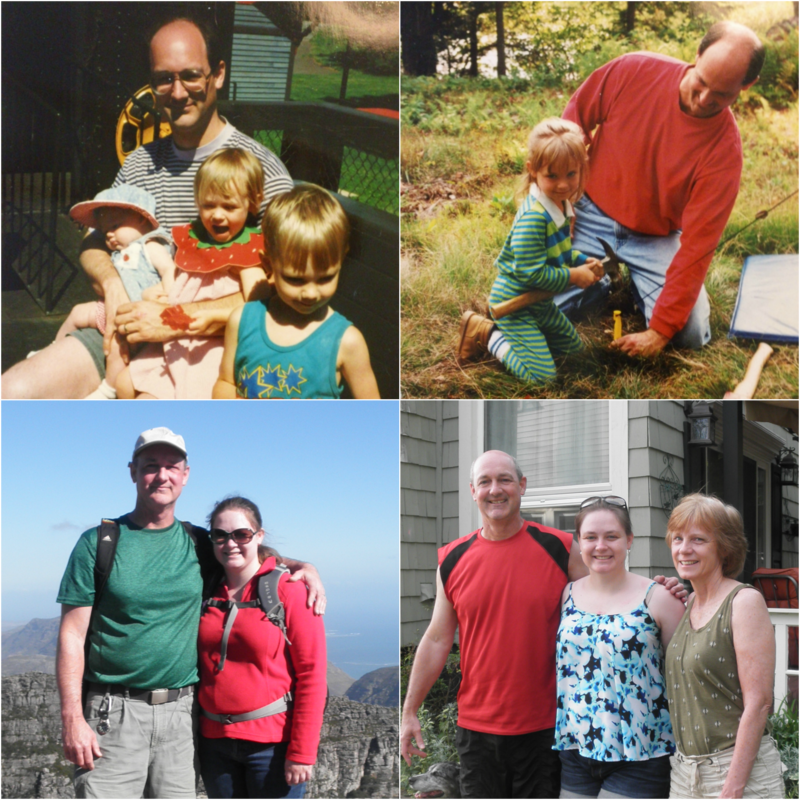 So to wish him “Happy Birthday”, here are some of the reasons I love my dad. 1. He has always been there with open arms when I was upset, angry, or just needed to feel loved. One of the hardest things about being away for so long is that when I’m upset, angry, and need a hug, my dad isn’t there to provide it. He has always been there for me, and has always comforted me when I most needed it. 2. He never told me I couldn’t help because it was something “men” do. As far back as I can remember, the thing I most wanted to do was whatever my dad was doing, whether that meant painting walls, sanding cabinet fronts, building things or stacking wood. He always let me help and taught me how to use all of his tools. My brother may not be able to use an electric drill (just kidding, Chris- I think you maybe have learned by now! ), but I certainly can, as well as the circular saw and table saw. 3. For allowing us to choose the sports we wanted to play even though they weren’t “his” sports, and for being there at every game, meet, and match. For several years, my dad taught my booster club basketball team, only for me to switch to an entirely different sport in high school. He never once second-guessed my decision, and continued to be at every sporting event to cheer for me. Even the many-hours long track meets where I competed for less than five minutes or the soccer games that were a couple hours away. 4. He has always encouraged me to chase my dreams. I have never wondered if my parents supported me in my dreams. When I told him that I had applied to the Peace Corps, he was a little surprised and then told me he was proud of me. When my siblings and I talk about opening our own business, he sends us links of similar businesses or how-to guides. 5. He encouraged us enthusiastically to be involved in music from a young age. And then he spent hours upon hours researching instruments and then spending even more hours finding excellent instruments to buy for us at prices my parents could afford. Seriously, if you know him personally and need help purchasing instruments (well, violins and saxophones to be specific), he has a lot of knowledge (and I played those instruments while he did not)! Also, he put up with my sister and I learning to play the violin at 5 and 7 years old, and that is not a pretty sound! 6. He (along with my mom) ingrained in us a love of travel, new experiences, and exploring. Throughout my life, they have made sure we traveled and experienced new things. They saved, went without other things, and planned carefully so that we could travel each year and see new places. I can’t wait until my parents visit me here in Moldova and I can be the one to plan their trip after all these years of them planning my trips. 7. He taught me the basics of spending time outdoors: squatting in the woods, thrashing through briar patches, and appreciating the natural beauty that abounds around us. I can’t remember the time before I knew how to squat (a skill that has been very useful here! ), and he taught me that both literally and figuratively, getting off the path can be more adventurous and (sometimes) more fun. 8. He let me “steal” from his secret stash of peanut M&Ms and bought me ice cream on occasion behind my mom’s back (sorry for telling on you!). It may not have been the healthiest thing, but it made me feel special and we often had the best discussions while eating the ice cream in his truck. 9. He made my birthday special by taking me on an annual father-daughter Christmas shopping trip. I am a Christmas baby, and just like any other Christmas baby, it is easy to feel like your special day is overshadowed by the amazing holiday that we share our day with. When I was five, my dad decided to take me Christmas shopping for my mom and siblings as a way to make it a bit more special. This year will be the first year since I was five that we won’t be able to continue this tradition, and I’m missing it. More than the actual shopping (I’m not big on shopping, actually), it was a special time to just spend time together, as well as get a nice lunch/dinner (though that first year when my dad asked me where I wanted to go I proudly told him “the place with the little girl”, which happened to be Wendy’s). 10. For sharing his love of houses and architecture with me. For as long as I can remember, we have driven around talking about which houses we liked, and he even occasionally has taken me to check out houses he has for sale and took me along on a couple of his showings. For the past few years, we have gone to historic home tours in our town. There are so many more things I could add to this list. He has supported me, loved me, has shown me what a good husband/dad should be. He has spent time with me, was patient with me as I learned new skills, and was simply there for me. Dad, I love you and hope you have an amazing birthday! Thank you for everything you have done for me!